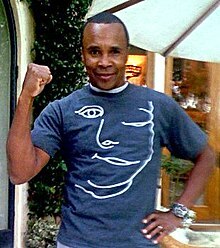 Ray Charles Leonard (born May 17, 1956), better known as Sugar Ray Leonard, is a former American boxer. He was born in Wilmington, North Carolina. Leonard is believed by many to be one of the best boxers of all times. He was named the "Boxer of the Decade" for the 1980s. Leonard retired with a record of 36 wins (25 by knockout) 3 losses and 1 draw. He also won the gold medal in the 1976 Olympics. His mother named him after singer Ray Charles. ↑ "Mark Grossinger Etess Award". Boxrec.com. Retrieved 2011-11-04. This page was last changed on 21 February 2017, at 12:57.